Eleven-year-old Faiga lives with her family on a small egg and poultry farm on the outskirts of Kiev, near the Dnieper River. They certainly aren't rich, but Papa has always been able to give tzedakah and provide his family with all their yom tov needs. But this year, money is tight and things look grim. Faiga is so anxious to help her family. But just what can a young girl do on her own? 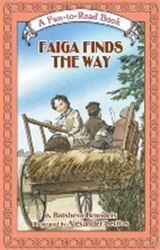 This historical fiction story gives the reader a glimpse into the daily life of a family in Eastern Europe in the early 1800's. This short chapter book, designed for the newly independent reader, can also serve as exciting read aloud material in the home or classroom.